Last week was the second annual Treaty Recognition Week in Ontario. Organized by the provincial government, this is a time for Ontarians to acknowledge and learn about the treaties upon which the province was developed. This year, Ontario’s Ministry of Education announced that Indigenous history and culture would become part of the K-12 curriculum by fall 2018. In southern Ontario, treaty recognition is sorely needed. Here, the late-eighteenth and early-nineteenth-century treaties that enabled settlement on Indigenous lands remain poorly understood. Though individual First Nations, the Union of Ontario Indians, and the provincial and federal government all provide basic information about these treaties on their websites, most of these initiatives are relatively recent. From a comparative perspective, there are no parallel in-depth studies to the relatively vast literature on treaties elsewhere in Canada. The most comprehensive resource that I have found remains Robert Surtees’s 1984 Land Surrenders in Ontario in addition to a handful of academic journal articles, doctoral dissertations and more local studies. This dearth of accessible resources is a problem. It suggests that in the most populous part of Canada, there exists only a rudimentary understanding of the legal foundations upon which Ontario developed. Here I do not just mean ignorance within the general population, but – given the absence of adequate contextual studies – also an ignorance in the institutions that draw on these types of resources such as the courtroom, the classroom, and the hallways of government. In contemporary Canadian society, there exists a wilful ignorance of the Indigenous governance, economic, social and cultural structures fundamental to the treaty-making process. We could point to someone like Senator Lynn Beyak, as a clear example. Or former Nova Scotia Department of Justice lawyer Alex Cameron, who was fired from his post after filing a legal brief on behalf of the government declaring the Mi’kmaq a conquered people. And of course, there are well-known political pundit Tom Flanagan’s First Nations, Second Thoughts and Stephen Harper’s 2009 declaration that Canada was lucky because it had no history of colonialism. Ignorance of treaties and Canada’s colonial past remains pervasive, it seems. When I meet with Indigenous colleagues, friends or neighbours, or read books and articles by Indigenous scholars, I often hear about revitalization of languages and histories. First Nations are recovering the truths of their pasts; articulating continuities and survivances anchored in the Land and territory, and reawakening histories often glossed over by scholars. These acts are important because much of the history in the lower Great Lakes was actively unwitnessed by those who recorded it. Ontario’s history, specifically the absence of critical study of the lower Great Lakes treaties, is a product of this unwitnessing. When I meet with settler colleagues, friends or neighbours, I often hear about the need for reconciliation with First Peoples. In the aftermath of the Truth and Reconciliation Commission, many people in Canada want to affect positive change that rectifies the longstanding injustices inflicted upon Indigenous peoples. Too often, though, the Truth part of Truth and Reconciliation is set aside. In Ontario, when it comes to treaties, I’m not entirely sure we know yet what those truths are. Centuries of unwitnessing have left a legacy that remains to be uncovered and learned anew. The Government of Ontario should be applauded for beginning Treaty Recognition Week (which was created with unanimous support in the legislature) and for introducing Indigenous history and culture into the curriculum. More, however, needs to be done and these efforts must extend beyond government. In southern Ontario, we need to start by listening to, and learning from, First Peoples when they bear witness to the pasts, presents and futures of this Land. Among many others, people such as Christi Belcourt, Leanne Betasamosake Simpson, Susan Blight and Hayden King and the Chippewas of the Thames demonstrate well the impact of colonialism on the Land and People, the changes that are needed in the present, and a hope and optimism for a future beyond the colonial legacies imposed by unwitnessed treaties. Thomas Peace is an assistant professor of Canadian History at Huron University College and an editor at ActiveHistory.ca. He lives on land negotiated for in the 1796 London Township Treaty. If you live in North America, learn more about your treaty history here. Here we might look at Marie Battiste, ed., Living Treaties: Narrating Mi’kmaw Treaty Relations (Sydney: Cape Breton University Press, 2016); Frank Tough, Bounty and Benevolence: A History of Saskatchewan Treaties (Montreal and Kingston: McGill-Queen’s University Press, 2014); William C. Wicken, The Colonization of Mi’kmaw Memory and History, 1794-1928 (Toronto: University of Toronto Press, 2012); John Long, Treaty Nine: Making the Agreement to Share the Land in Far Northern Ontario in 1905 (Montreal and Kingston: McGill-Queen’s University Press, 2010); Christopher McKee, Treaty Talks in British Columbia: Building a New Relationship (Vancouver: UBC Press, 2009); Treaty Seven Elders, The True Spirit and Original Intent of Treaty 7 (Montreal and Kingston: McGill-Queen’s University Press, 1996). 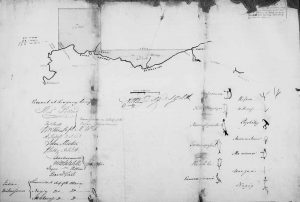 For a handful of examples see Jean-Pierre Morin, “Concepts of Extinguishment in the Upper Canada Land Surrender Treaties, 1764-1862” in Aboriginal Policy Research, vol. 7, (2010): 15-40; Victoria Freeman, “‘Toronto Has No History!’: Indigeneity, Settler Colonialism and Historical Memory in Canada’s Largest City,” (PhD diss, University of Toronto, 2010); John Clarke, Land, Power, and Economics on the Frontier of Upper Canada (Montreal and Kingston: McGill-Queen’s University Press, 2001). There are also important overview texts such as John Borrows and Michael Coyle, eds., The Right Relationship: Reimagining the Implementation of Historical Treaties (Toronto: University of Toronto Press, 2017) and J.R. Miller, Compact, Contract and Covenant: Aboriginal Treaty-Making in Canada (Toronto: University of Toronto Press, 2009). Very informative! Thanks for educating me. It is a start to help the young know about the land they live on. 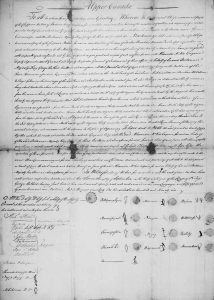 “Negotiating treaties” in colonial times did not seem to be a level playing field. Good piece. thanks for this!